Haling from Chicago, Mr. Greenweedz is part of the All Natural Family Tree. His new album G-Strings, is a collaborative effort with producer G.Riot. Greenweedz spoke with MVRemix.com about the album, as well as a variety of other intriguing issues. MVRemix: I just want to start off with some background questions so our readers can get to know who you are beyond the music. So where were you born and raised, and what was it like growing up there for you? Mr. Greenweedz: I was born and raised on the Westside of Chicago. Coming up as a kid, I went 2 public school ( I learned to cuss in public school). My block –Cortez Street—had a lot of different families - black and white. When I say I’m from the west side and mention there were white families, people quickly assume they had to be poor, but there were lower middle class middle class families on Cortez. MVRemix: In what ways do you think your environment or surroundings helped shaped you into the man you are today? Mr. Greenweedz: I swore - during the ‘80s - I thought a spy from Hollywood lived on my block because we had some funny motherfuckers in the neighborhood. Fortunately, for me I had a father and an older brother who taught me about life, hustling, and women. They showed me the ropes, but more from an armed chair quarterbacks perspective. My father was like a vigilante/hustler while my brother was over 20000 or more Vice-lords, but they wouldn’t let me get involved in the streets, but at the same time, wouldn’t hide it from me either. And though one constantly evolves, I take that street savvy with me wherever I go. The West Side taught me to respect the streets—they cold but fair. Mr. Greenweedz: I didn’t really know when I listening to Sugar Hill Gang, Treacherous 3, Kurtis Blow that it was hip hop. I just thought rapping was an alternative to singing, but I did know I dug it. MVRemix: What was the one album you listened to growing up? Mr. Greenweedz: Man I had a few…that Cameo “ Word Up" album, which I listened to a lot. Also, any Prince album from Purple Rain to Sign of the Times, as well as The Bob Marley “Kaya” LP. My old man Introduced our household to Bob in the late ‘70s. MVRemix: How did the two of you first meet and eventually connect to do this album? Mr. Greenweedz: G says it was the Elbo Room, but maybe because of all ‘the cigarettes’ I smoked I forgot. I remember us meeting at the Shoreland on University of Chicago's campus at our boy Cosmos’ crib. He came over with Capital D. We were doing music way before this album was even a thought. MVRemix: Tell us about G- Strings. What types of songs, concepts and issues can fans expect to hear? Mr. Greenweedz: The one concept of G-Strings is both G.Riot and Greenweedz both start with G. And G’s sound was unique and refreshing –that’s how Hip hop should be! So I wanted to write in that vein. I didn’t want to come off like I had all the answers but I did want to present some compassion in this record. MVRemix: What do you want people to come away after listening to this album? Mr. Greenweedz: I want people to feel like they need to listen to it again after they hear it once. Dope music never sounds the same after the first listen. Generally you come away with something different every time. Believe or not, I don’t like to dictate what listeners should come away with. Each person hears differently. G and myself are just here to service as a guide. MVRemix: What would you say your strong points are as an emcee? Mr. Greenweedz: My openness — I’m down to try almost anything musically. When I listen to beats, I first hear for the feel good, the laughter, the mood, the freshness. Then I determine what to do with it. I’m also pretty fearless, no audience frightens me. When we’re doing family tree shows Kev use to call me the lead off man while Tone called me the closer. Both are compliments in a way that it says they’re confident when it’s money time. Plus, I’m from the school of emceeing when you had to battle, story tell, be conscious and party—I respect the craft and always have. MVRemix: What has been the biggest headache you had have to deal with in this Hip Hop game? Mr. Greenweedz: The morals of originality that I have with hip-hop are the same morals that are refuted. Cats prefer to cookie cut hip hop. That’s not hip hop, that's biting. MVRemix: Do rappers who create these overblown images and characters of themselves make it harder to the average guy rhyming? Those who don't make up these characters and just act themselves? Mr. Greenweedz: Not really, I can’t really hate on the entertainment. I like a good ‘ham’ just like anyone else. It’s just show biz. The quicker you realize that, the easier it is to allow yourself to embrace perception or reject it. 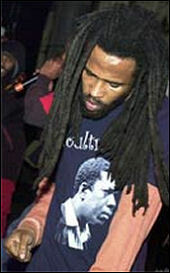 MVRemix: Do you think the media is to blame for the lack of education these youngsters have on the history of Hip Hop? Mr. Greenweedz: I blame the artists - if there is blame to be placed. I mean we just have to be held accountable to or for the youth. Mr. Greenweedz: Ideally, we need to own and constantly empower ourselves. But that’s an ideal world - or is it? MVRemix: Any other projects you guys are working on in the future? Mr. Greenweedz: Obviously, me and G are still working. I’m on the John Popper project wit D.J. logic. A Jungle Brothers Fam Tree LP is also in the works, a Dug Infinite and Mr. Greenweedz LP as well. So I’m excited about the future. Mr. Greenweedz: Peace to King, Bobby Simmons, Family Tree, Liquid Soul, J Beez, Rohan Marley, Cosmos, my wife Zada (I Love u). Thanks for watching the White Sox win the World Series with me. "I want people to feel like they need to listen to it again after they hear it once. Dope music never sounds the same after the first listen."